This is a 316L surgical steel internally threaded prong set square jewel dermal top. This dermal top fits into a 14 gauge dermal anchor. The anchors are sold separately. 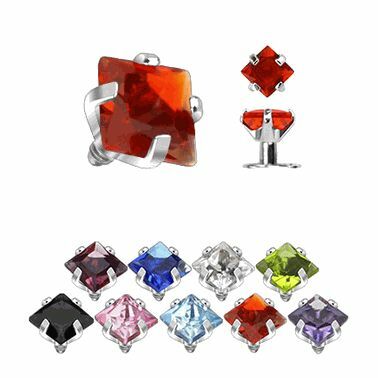 Comes in variety of cz jewel colors. Available in 2 jewel sizes (2mm and 3mm). Made as one piece. Not welded. Autoclave safe. This item is sold individually. Item is nickel free.